At the IQ Center of Excellence (CoE) we share documents, presentations, and other downloads. We would like you to get acquainted with our way of work, our beliefs and our viewpoints. For questions and comments, you can contact us, of course. 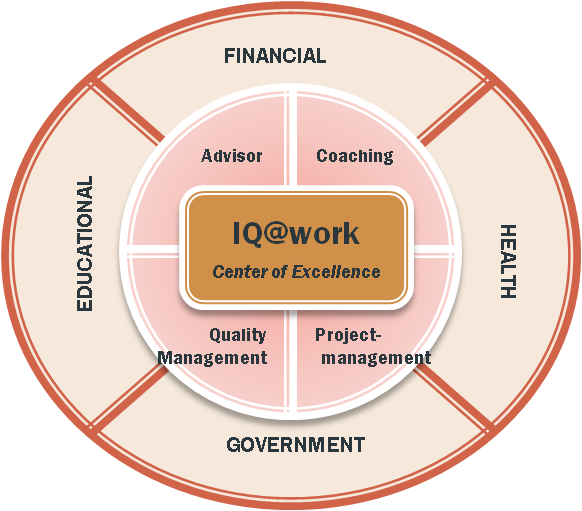 The professionals of IQ@work have years of experience in Higher Education in the role of project manager, change manager/coach and as quality manager. Quality management does not replace the role of the project leader or the accountant/auditor, but enables the realization of the necessary quality, both in terms of content and in terms of the process that is followed, in support of the Steering Committee. Project management as a critical success factor? For years, Project management is listed in the top three of critical success factors for the success of a project. The importance of the success of projects for the total organization increases (Return on Investment). The technical and organizational complexity increases as well. It is our strong/belief that excellent Project management is in place when not only the realization of individual projects and their project objectives is managed, but also the realization of the underlying business objectives is managed. The business case of each project must sustain. Once this principle is abandoned, programs become uncontrollable and company objectives may be lost out of sight. The “controlled environment thinking” of PRINCE2 may prevent project failure, but it doesn’t guarantee success. Socrates (Yes that philosopher) has developed, among other things, interview techniques that are quite usable in projects and programs.